Figure 1 provides the broadest perspective on SEC enforcement practices: Who does the SEC name as defendants? The answer is that it names individuals in 88% of its enforcement actions. 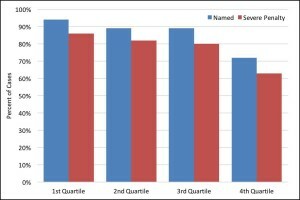 In 63% of its cases, the SEC names both a corporate defendant and individual defendants, and in 25% of cases, the SEC names just individuals. * Includes all cases filed between 2000 and 2014, including those that remained unresolved as of the end of 2014. The same pattern is present if we look at whom the SEC penalizes. We define “severe” penalties as all penalties other than injunctions and cease and desist orders. For corporations, severe penalties include disgorgement and monetary penalties. For individuals, severe penalties also include temporary and permanent bars from serving as a director or officer of a public company. 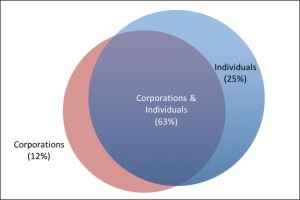 As shown in Figure 2, the SEC imposes severe penalties on individuals far more frequently than it does on corporations. It imposed severe penalties on individuals in 62% of cases and on corporations in 18% of cases during the time period covered in this blog. The SEC imposed severe penalties on corporations without imposing severe penalties on individuals in only 4% of cases. * Includes cases that are fully resolved against all defendants named in a set of cases involving the same underlying allegations. For example, if there are three separate cases filed (in court or an administrative proceeding) against the company, the CEO and two other executives, this chart includes cases where all proceedings against all defendants are resolved. For corporations, severe penalty is defined as a monetary payment or disgorgement, and for individuals it is defined as a monetary payment, disgorgement and a bar from serving as a officer or director of a public company. Figure 3 provides a breakdown of penalties the SEC has imposed on corporations. 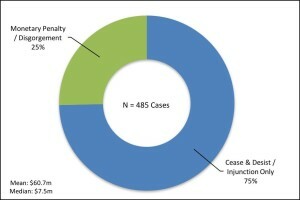 This chart includes only those cases in which the corporation is named—75% of all cases, as shown in Figure 1. The SEC imposes monetary penalties or disgorgement on companies in 26% of those cases. This comes to about 20% of all cases resolved during the 2000-2014 time period (26% times 75%). * Includes all cases in which the corporation is named and the action against the corporation is resolved. Those who perceive the SEC as soft on individual executives might be focusing on SEC actions against large corporations. It is true that executives who work for large corporations are named as defendants less often than executives at smaller corporations. 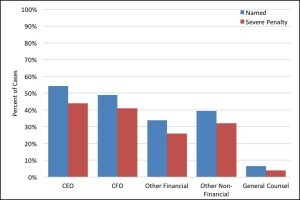 Figure 4 shows that in cases against large market cap companies, the percentage of cases naming and penalizing individual executives is lower than in cases against smaller companies. 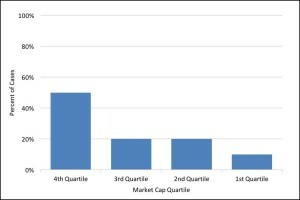 Moreover, Figure 5 shows that most of those cases in which only the corporation is named (12% as shown in Figure 1) involve corporations in the largest quartile of market cap. These numbers suggest that there may be an issue with respect to holding executives of large companies responsible for disclosure violations, but they do not justify the rhetoric of some commentators who imply that individuals are almost never held to account. * Includes all cases during time period for which market cap data is available on CRSP. Even if, as we now see, individual executives do in fact incur severe penalties at the hand of the SEC, perhaps the most senior executives escape liability. Figure 6 shows that this is not true. CEOs are named and incur penalties more frequently than do other executives. D. How Much Do Executives Pay? Finally, one might ask how severe individual penalties are. Monetary penalties are governed by statute and are low in comparison to both losses imposed on shareholders and compensation of executives. On the other hand, the SEC frequently imposes bars on individuals against serving as officers or directors of public companies in the future, and other research I have done has shown that even without a bar, the vast majority of executives that the SEC has charged with violations of the securities laws leave their jobs and do not land well. Finally, while criminal prosecution for securities fraud is much less frequent than SEC prosecution, the risk of criminal penalties for an individual executive is present. 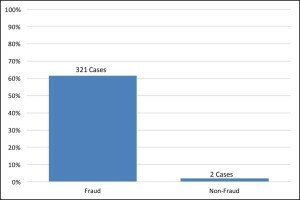 As shown in Figure 7, individuals incur severe penalties in 86% of cases settled on the basis of fraud charges, and 27% in cases settled on the internal controls and books and records charges. * Fraud cases are defined as those that settle based on Section 10(b) claims or Section 17(a). Section 17(a) includes subsections for which negligence is sufficient and therefore proof of fraud is not required. But often the SEC does not distinguish which subsection of 17(a) it is relying on. Non-fraud cases are those that settle based on books and records and internal control claims and no 10(b) claims. Severe penalties are defined as monetary penalties, disgorgement, and bars. 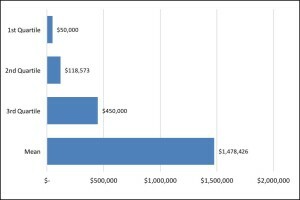 Figure 8 shows that where the SEC settles fraud charges against executives, executives generally pay low statutory penalties, but the top quartile penalties get fairly large. The mean penalty is about $1.5 million—compared to a median of $118,000. Moreover, Figure 9 shows that D&O bars are imposed in over 70% of cases against executives. Often defendants incur both monetary penalties and D&O bars. 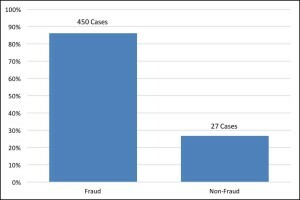 Figure 10 shows that D&O bars are also common in fraud cases—and less common in non-fraud cases. 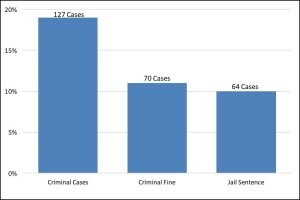 And Figure 11 shows that criminal charges are filed in nearly 20% of cases initially filed by the SEC and result in criminal penalties in nearly all of those cases. Mean and median criminal fines are $103 million and $1 million, and jail sentences range from 30 days to 25 years . The bottom line here is that executives frequently incur severe penalties in SEC enforcement actions—civil penalties, criminal penalties, and D&O bars. One could argue that the penalties should be higher—we have no view on that—but commentators who believe that executives are rarely punished are incorrect. The Stanford Securities Litigation Analytics database contains data on all SEC enforcement actions, litigated and administrative, involving disclosure violations by public companies dating back to 2000 and maintained to remain current. It also includes data on all securities class actions from 2000 to today. Michael Klausner is the Nancy and Charles Munger Professor of Business and Professor of Law at Stanford Law School and Visiting Professor of Law any NYU Law School. Jason Hegland is Executive Director of Stanford Securities Litigation Analytics. This entry was posted in Contributing Blogger Posts, Enforcement, Individual Liability, Securities and Exchange Commission (SEC) and tagged Jason Hegland, Michael Klausner on May 12, 2016 by Serina M. Vash.